Disassembly - The bracelet is removed from the watch whilst the case itself it disassembled. 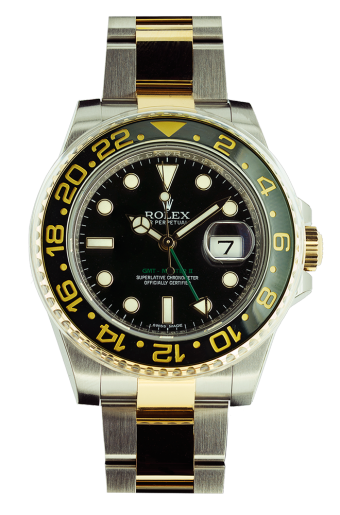 The movement is carefully taken out of the watch with the dial and hands removed and placed in a sealed chamber. The external parts of the watch (case and bracelet) are placed in the polishing room for further attention later in the process. Cleaning - The movement is now completely disassembled with all individual parts now ready to be placed in the Ultrasonic cleaner. We use the most up to date machinery for this crucial aspect whereby the automatic clean/rinse/dry stages of the process are done under Vacuum conditions which means that the cleaning and rinse fluids can get to the smallest of areas on each component ensuring the deepest clean. Assessment - Once the cleaning process has been completed, each and every component is then carefully assessed on it's condition. Any worn or damaged movement parts are they replaced with Manufacturer supplied components. Reassembly - The movement is now ready to be reassembled with the relevant contact points having the correct lubricant applied to ensure smooth motion and minimise friction. Timing Assessment - Once the movement has been full assembled and lubricated it is then adjusted and regulated to Manufacturer specifications. Refurbishment - The case and bracelet are now attended to with any abrasions/scratches taken out and the original finish being applied. They are they placed in an Ultrasonic tank before a steam clean and dry. Casing - The dial and hands can now be re-applied to the movement and placed back in to the case where new seals/gaskets are applied and then the case back. Testing/Quality Control - The bracelet is now attached to the watch case and the watch is left on test for a period of time. All functions at this point are tested as well as finial time-keeping checks. Once our Watch Technician is satisfied with the results, the watch will then be ready for release with a 12 month warranty.